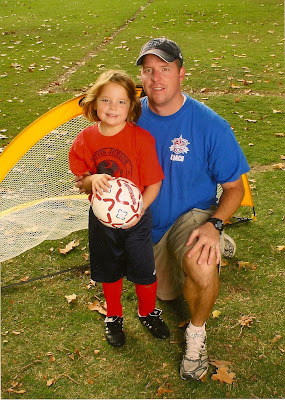 Lizzie had a great soccer season. She made lots of new friends, scored lots of goals, and got lots of daddy time as he was one of her coaches during her first year of soccer! She is quite the little athlete. She runs like crazy and pays attention the entire time - no wandering off to pick flowers or anything like that. She really gets into it! This second picture is classic. The look on her face is priceless. She scored one of her first goals and was so pleased with herself and could hardly believe it - that's what sheer joy and disbelief look like on a 5 year old. It was a great season and we look forward to many Lizzie soccer seasons in the years to come. Goooooo Lizzie! !